Happy Holidays - from our family to yours! 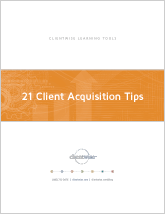 How are you acquiring clients today? What is My Future Company? Is Your Next-Gen Talent Here to Stay? When’s The Right Time to Sell Your Business? Profit or Purpose: What Truly Drives You? Is Your Kid the Right Succession Plan for Your Business? I'm on Social Media, Now What? Will the Fiduciary Rule Open the M&A Floodgates? Wealth Advisors: What is Your Business Really Worth? Don’t Fear the DOL Rule, Embrace It! How Much is that Advisor in the Window? Take the Quiz: How Good Are Your Communications Skills? Social Media for Advisors: Silence is NOT Golden! What Skills Does Every Leader Need to Master? Durability, Profitability and Sustainability: What's the Difference? Improve Your Hiring Process -- Think Strategically! Are Your Marketing Efforts Stuck in the '80s? What’s Your Strategic Employee Onboarding Plan? Why Should You Worry About Generational Wealth? How Strong Is Your Team? How Do You Rate as a Leader? How Are you Connecting with Your Clients? What Do You Do When Your Professional Advocates are Wrong? Not All Referrals for Advisors are Created Equal. Can You Recognize The Difference? Building an Advisory Team: What is Common Intent And Why is it Important? Financial Advisors: Has Your Pipeline Left the Building? Financial Advisors! You’re Talking, but What Are Your Clients Hearing? Financial Advisors, Could Your Webpage Be Costing You Clients? 5 Actions Financial Advisors Should Take on Social Media TODAY! To Plan for Succession or To Determine Enterprise Value? Credentials...Are You a Journey Learner or Hungry for Alphabet Soup? Is Your Strategic Mindset Out of Shape? Breakup Emails as Prospecting Tools? Like Totally Awesome! Should Financial Advisors Have a Minimum Account Size? How to Increase Your AUM by 49%: Set Clear Goals…and Reflect Back! Honoring Rev. Dr Martin Luther King Jr.
Financial Advisors: Dump Your Assumptions About Millennials! Get Fit. Build Your Business. Love Your Family. All Together Now! Financial Advisors: How to Frame Your Goals in Three. Simple. Words. Are You Guilty of Ambush Coaching? How Do Top-Performing Advisor Teams Identify and Resolve Conflict? Moneyball tactics for recruiting Financial Advisors – yup, it exists. Geo. Washington, Thanksgiving, and Enjoying Our "Temporal Prosperity"
Financial Advisors: Best Times of Day to Engage Clients with Email? Financial Advisors: Does Your Client Service Hijack Your Schedule? A ClientWise Super Bowl Commercial? Financial Advisor Coaching: Are You Ready? Financial Advisors: How do Comparisons (to Others) Serve You? Has Your To-Do List Become a To-Don’t List? D-D-D-D-Do this. Financial Advisors/Leaders: Improve Team Delegation. Pass the Baton. Are Female Financial Advisors the Key to the Industry's Future? What % of Your Potential Have You Achieved as a Financial Advisor? Financial Advisors: How Do You Rank vs. Your Peers with Social Media? Financial Advisors: Free Up Time: Don’t Do Everything. Financial Advisors: How to Frame Yourself as "Irreplaceable"
Financial Advisors: What do you want to achieve in the 2nd quarter? Financial Advisors: Are your goals bold…or boring? Client Communication: Are you sending too much? Beyond SMART Goals: Will your goals help you achieve great things? MSSB Financial Advisors Embrace Digital Marketing: Where are You? Financial Advisors: Are You Stuck on the Tracks? Sprint into Summer. What Top Financial Advisors Do. Financial Advisors: Ask a Question. Change a Life. Financial Advisors: Do you really want to “pitch” your clients? RSS Readers: Save time. Help clients. Market better. Financial Advisory Paradox: Where Are All the Women? "The rich are very different from you and I." "Traditional planning is just table stakes." "You have everything you need to build something far bigger than yourself." "You define yourself by what you can do, not what you can't!" Building A Value Proposition: Financial Advisors, It's Not About You! "All the News That's Fit to Print"
Your Brain Doesn't Care How Old You Are! Post-Crisis: Has Investor Psyche Changed? Kids?...or a Bentley Flying Spur? Alan Greenspan Missed the Last Bubble, Will Your Clients Miss the Next One? Quest for "The World's Greatest Salesperson"
Have You Been Feeling Off-Kilter Lately? Do You Feel Like Your World is Spinning Faster? "Plans are nothing: planning is everything." Email is dead. Long live Email!